President Obama may not be using the department of energy’s failed experiment, Solyndra, to be providing the newest solar panels for retrofitting the White House. But, they are American made and being installed, for the first time since 2010, when Obama became only the third president to use solar energy at the White House. We can mark this occasion as a ceremonial nod to technocrats and environmental advocacies within his party. Uneventful as it is, considering the Obamas will be having the upgrades done while they are vacationing. So more of an unspoken agreement, than a ceremonial nod, between all interested parties. A perfunctory bone thrown by a president whose embroiled battles with congress seem to suggest that this is all there is left of his second term in office. So far, it seems like the road less traveled by our politicians. Contrast the previous report with another solar power story. Google’s sponsored solar plane is gearing to take off for the presuming record books. Google is working the project to generate attention for their social sharing tools while highlighting a solar airplane’s flight around the world. 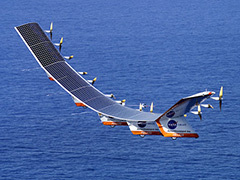 Solar Impulse is the company that aims to make planes which can fly day and night without fuel. Impressive? Now, imagine these cost savings passed onto the consumer, since fuel is relatively the largest fluctuating variable in the cost of a plane ticket. This is where we are at in 2013. Federal government failures have cost the president power he could have used to steer government investment toward technology and infrastructure. He could do little through the legislature in its present state. With the current shutdown and overall lack of budgetary direction, the public’s desire for somebody to take the lead is in place. Somebody that can move federal resources and invigorate the talking points, partnering public and private investment toward producing energy saving technology to retrofit our aging electrical grids. While we’re sure that the White House’s solar panels are fantastic, we hope they do more than power the water heater. It just seems like more style over substance. Why not go further? Mr. Obama pledged in June that federal buildings will consume “20 to 30 percent” of their electricity from renewable resources. Does the president simply not have the right person’s ear, or is it vice-versa? So the federal government may not be fighting to spur our ever reaching, yet still slumping economy, but those with the means and the capability of investing in the projects that sixty years ago would have been public works projects, are the flag bearers of sustainability movement, for now. Posted on October 21st under Energy of Stars.